Headache rack is a colloquial term used in the trucking community to refer to truck racks, also known as cab guards. These are very useful tools that can allow you to maximize the efficiency of your pickup truck and ensure that your cargo remains intact. A lot of truckers swear by headache racks and claim that they are essential to any truck’s overall apparel. However, there is some mystery behind the origin of the term. Why are innocuous truck racks referred to as such? What is the origin of this term and does it hold any meaning to the overall use of this truck accessory mainly used for window protection? E Coated Under Powder Coat For Double Corrosion Protection. Toolbox Compatible With Toolbox Hardware. Note: Click any of the images on this article to see the product in the image on Amazon! There are two possible origins to the term and both of these explanations are essentially two sides of the same coin. The first explanation speaks to the usefulness of these racks. Transporting cargo on a truck can be rather bothersome, particularly if the object or cargo you are transporting is large or cumbersome. You would have to tie your cargo down in order to ensure that you do not end up dropping and, thus, damaging it in any way. Additionally, people who are sitting in the back of your truck might feel a little uneasy, particularly if you are driving over rough terrain. This is because they might feel like they could fall off at any moment since they do not have anything they can hold onto in order to keep themselves stable. Truck racks can save you from a lot of this headache. They provide a frame on which you can store your cargo and secure it with ease. Transporting cargo with a truck rack is a lot easier because you would have a more solid support system on which to tie it down, thus enabling you to ensure that you do not damage or drop it on your journey. 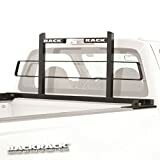 People traveling in the back of your pick up truck would also feel a lot safer if they were traveling with a truck rack since they would have something to hold onto. They would be less likely to fall off, even if you are driving on some bumpy terrain, and you can attach harnesses and the like to your rack in order to make your backseat passengers feel even more secure. Steelcraft 90001 fits various trucks ranging from GM, Ram, Toyota Tundra to Ford F150 for example. The second possible explanation for the origin of this term is slightly more comical and, thus, provides a more lighthearted premise for the term. Truck headache racks can be rather ungainly and large. Truckers who have recently had one installed might not be used to its presence and might end up banging their heads on it while they are getting back up after securing their cargo. Naturally, since they have just hit their heads, these truckers would end up getting a headache. It is highly possible that this is the true origin of the term, as truckers tend to have a jovial and congenial attitude and approach most things with a lighthearted sense of sarcasm. If you have owned a truck for any meaningful length of time, you would know that long journeys or regular use can result in your truck getting damaged a great deal. The size of most pickup trucks makes them easy to damage and since you would be encased within the shock-proofed bosoms of the truck, you would not even notice that the damage is being incurred. These metal beauties can help prevent this damage from occurring. The name cab guard might be a bit more telling as it literally protects your trucks cab. They form a chassis of sorts, a casing in which your truck remains secure. The larger varieties of truck racks can actually provide a great deal of protection for your vehicle. This is useful in the long run because you would end up spending far less money on maintenance and the like than you would have otherwise, and this can help you gain a huge advantage over terrains that might have otherwise caused you some serious financial loss. Without a doubt, truck accessories like these are a long-term investment, and this is just one of the reasons why they are worth it from a financial point of view. If you own a work truck, the chances are that you are the kind of person who has to transport a great deal of cargo on a regular basis. Whether you do this for business or personal purposes, a truck is used primarily for its space. Some truck racks come equipped with a tool box and they are specifically designed to help capitalize on this need for room. Without a truck rack, you would only have the room that your cargo space provides and not much else. Stacking cargo up too high can be dangerous and might end up causing damage to your cargo or to people surrounding your vehicle while it is being driven. By using a rack, you can double or sometimes even triple the amount of cargo you would be able to carry at any given time. This is really important to the overall usage of your vehicle, and an added bonus is that you would not have to face any accusations of illegality if you are transporting more cargo than your truck would have otherwise been able to carry. Overloading your truck can result in some hefty fines, so having a truck rack can help you save money by preventing such fines from being incurred in the first place. Trucks are rather ungainly vehicles, so in the case of an accident, there is a strong possibility that you might suffer from some type of rollover. A rack can prevent this from happening. It can secure your car and pretty much stop it dead in its tracks in a situation that could have resulted in a rollover. This can save lives and prevent your car from getting damaged in the case of an accident. The amount of money this can save is difficult to calculate, but suffice it to say that you are certainly going to end up saving a great deal. Hence, using these beauties can be a sound investment in your future. Your cargo will also be protected in case of a rollover, which is always something to appreciate. If you use your truck to regularly transport cargo that costs a great deal of money, investing in a truck rack can, to use the more lighthearted origin of the term, prevent a lot of headache for you, which makes it worth the money you would be spending to get it installed. Nowadays, truck racks have become so common that not having one can end up looking downright odd. A truck without one almost looks naked! Hence, if you eye for truck beauty, you can actually make your vehicle look stylish. This may seem like a superfluous advantage, but if you are a enthusiastic about pickups, you would know that looks matter. Even if you don’t currently drive one you probably can appreciate the sight of a rack combined with a tonneau cover. The same applies to all accessories: bed rails, bed caps, running boards, bull bars, roof racks, side rails, ladder racks, grille guards, mud flaps, off road lights, even amplifiers and speakers – what’s not to like? The beauty is in the details. People want to stand out in the crowd, and trucks are designed to help them do just that. With a good looking piece, you can amplify the looks of your vehicle and help yourself stand out even more in traffic. Coupled with the added storage space you are getting along with the enormous boost in safety, this means that these relatively simple pieces of metal are a superb choice for pimping your vehicle. The bonus style points certainly sweeten the deal and make it one that you wouldn’t even consider refusing unless you wan’t to hide in the shadows – but then again you would not drive a truck then would you? What Makes a Good Truck Rack? Durability and Weight: This is a tradeoff much like every other truck accessory. If you want durability, you will have to get a heavier truck rack. However, this will obviously reduce the speed at which your truck would be able to travel, which is unacceptable for a lot of truckers. Price: The heavier racks are generally more expensive, so if you don’t need so much protection, it doesn’t make sense to spend that much money on it. Additionally, big name brands tend to overcharge when it comes to racks, so you might end up spending extra money on something you might have gotten for far less. Material: Truck racks come in two different materials: aluminum and steel. Aluminum is a light but sturdy material and is perfect for truckers who want some protection but speed as well. Steel is for those truckers who want the maximum amount of protection for their cargo and have a truck large enough to handle that much weight. Steel can be dangerous for smaller trucks because it can make the weight of the truck uneven, which can potentially cause accidents. Additionally, steel does not look as good as aluminum. Once again, you are going to have to decide which benefits outweigh which disadvantages, so it is important that you keep in mind what you actually need from your rack in order to make sure that you get it. These are mounted on the truck bed. They are perfect for situations where you would need to optimize the space of your truck bed. If you generally transport a lot of cargo and need some extra room, bed mounted racks can double or even triple the room of your truck and allow you to store a great deal more cargo back there while keeping it safe. These can only be used on smaller trucks, however, and they should ideally be made of steel because you are going to need a strong metal to support all of the cargo you are storing. Hence, your truck needs to be powerful in order to maintain speed with such a heavy metal in the rear. This headache rack is perhaps the most stylish of the three options. These are mounted quite unsurprisingly on the roof of your vehicle. There are a number of situations where a roof rack could come in handy. If you generally transport lighter materials, these racks can be really useful. Additionally, if you do not have a truck bed but want extra storage space, getting a roof mounted truck rack can get you that extra room for cargo. The roof mounted versions are meant for smaller cars, so they are generally made of aluminum. However, it should be kept in mind that they are not quite as stylish as bed mounted racks tend to be. These racks are the best if you want something that can handle a lot of weight. They don’t provide as much square footage as bed mounted racks, but they can handle a great deal more weight because of where they are positioned. While these truck racks are the least stylish of the three, they are the only ones that can come in fiberglass. This is a great option because it can allow you to carry a great deal of weight without the rack adding to that weight, therefore allowing you to travel with a lot of cargo without compromising on speed.